The Master Gardener program is a volunteer program in which individuals are trained specifically to represent the University of Arkansas Cooperative Extension Service to help with providing approved information on gardening and to develop community programs related to horticulture. Master Gardener training includes 40 hours of classroom instruction and many hours of ongoing education in botany, soil science, plant propagation, pest management, pesticide and herbicide usage, vegetable and ornamental plant gardening, plant and weed identification, pruning, and other horticulture related subjects. 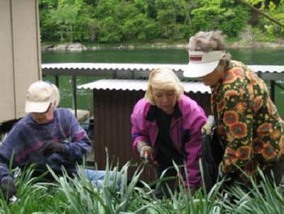 Once trained, Master Gardeners aid the Extension Service and give back to their local communities by doing work related to horticulture, such as designing and implementing community improvement projects, working with special groups in the community, disseminating approved horticultural information, answering questions, researching specific problems, planting educational and therapeutic gardens, providing public speakers and much more. The Baxter County Master Gardeners organization is affiliated with the University of Arkansas Cooperative Extension Service. The Arkansas State Master Gardener Program is offered by the U of A Cooperative Extension Service and is designed to increase the availability of horticultural information and improve quality of life with horticultural projects. During our monthly meetings, we have an interesting and educational program related to some aspect of horticulture or gardening. Some time is spent examining and discussing horticultural specimens brought in by members and and we frequently share gardening problems and solutions. A short business meeting is also conducted and, of course, refreshments are served! In addition to monthly meetings, Special Interest Groups (SIGs) meet from time to time. SIGs are an educational program designed for BCMG members with common interest to expand their knowledge in various topics, such as garden plants, wildflowers, herbs, vegetables, composting, pruning, propagation, pest control, irrigation systems etc. Members will be notified when a SIG is scheduled. Project involvement is a very important part of the group. All members contribute a minimum or 20 hours of work to projects annually (40 hrs for first year new MGs). At least half of these work hours must be in projects that have been designated as "sanctioned". A complete description of each project, along with photos, contact information, and locations can be found on the Projects & Events pages. Most of these involve gardening projects in the community around public buildings or parks. Members select which projects they wish to work on, but are welcome to work on any project on a scheduled work day. Project work can involve planting, weeding, garden layout and design, pruning, mulching, propagation, etc. Other sanctioned projects include propagation of plants for the annual plant sale, working in the Horticulture room at the Baxter County Fair, answering questions and providing information to the public and being a mentor to new Master Gardeners. The largest and perhaps most notable sanctioned event is our annual Gardening Seminar. While other groups may put on partial day seminars, our group puts on an all day seminar for the public which includes knowledgeable speakers on various gardening topics. Extensive gardening information is provided, and members provide horticultural specimens from their gardens for display. Specimens are identified where possible. Gardening crafts and books are provided by members for drawings, and of course, copious refreshments are served!